"It was fabulous! It's extraordinary beautiful," said Susan King, who works for a non-government organization promoting teaching exchange between China and the United States and was invited to watch the fireworks in the Consulate-General of China in New York. "The music was lovely. It's exciting to be able to come here to watch the celebration of the Chinese New Year. We feel very honored to be here for that," she said. Titled "Harmonious China," the fireworks display commenced at 7:30 p.m. local time (0030 Wednesday), utilizing three-barges on the Hudson River, nearly equaling the scope of the iconic Macy's Independence Day Fireworks Spectacular. Artistic director of the event Huang Jiancheng said he hopes to express the joy through the fireworks. Yu Ding, dean of Arts Administration and Education Institute, Chinese Central Academy of Fine Arts (CAFA), said that he hopes the tradition of lighting fireworks during the Chinese New Year will bring New Yorkers happiness and joy, and deliver Chinese wonderful blessings to the United States and the rest of the world. Viewing was possible along the Hudson River from both Midtown Manhattan and New Jersey sides, and there was also a live accompanying music broadcast on three local radio stations, featuring special music composed by Guan Xia, director of the China National Symphony Orchestra. 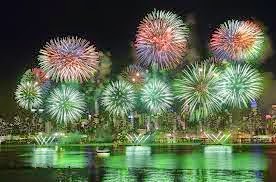 The fireworks display was divided into four thematic and emotional chapters -- starting with "Great Jubilance," followed by "The Return of Spring," then "Illumination of Stars and the Moon," and concluding with a powerful "Universal Celebration." The fireworks kick off a week of Lunar New Year events at cultural institutions around New York City as part of "Happy Chinese New Year: Fantastic Art China," including a public art exhibition at Lincoln Center, a lighting display of the Empire State Building and other events hosted by US and Chinese partners. A grand ceremony was organized Wednesday in Russia's northern capital of St. Petersburg to celebrate the start of Chinese lunar New Year which falls on Thursday. As part of the initiative to celebrate the Chinese New Year in the Russian city, the iconic Winter Palace Bridge on the banks of the Neva River in St. Petersburg has been adorned with red lanterns. According to Chinese Lunar Calendar, the year of 2015 is the Year of the Sheep. Actually part of a larger series of events on the 22nd February which also take place throughout Shaftesbury Avenue and Chinatown, the Chinese New Year at Trafalgar Square celebrations include a live show by Chinese performance artists and dancers. Central London will come alive with Chinese culture in a celebration marking the beginning of a new year.